Long time free banking advocate Kurt Schuler has a new piece at freebanking.org in which he endorses NGDP targeting. Given that I do not expect to see free banking in the immediate future, I would like to see one, or preferably more, central banks that now target inflation try targeting nominal GDP targeting instead. Targeting nominal GDP has some prospective advantages over inflation targeting. One is that nominal GDP targeting allows what seems to be a more appropriate behavior for prices over the business cycle, allowing “good” (productivity- rather than money supply-driven) deflation during the boom and “good” inflation during the bust. I agree very much with Kurt on this and it is in fact one of the key reasons why I support NGDP targeting. Central banks should indeed allow ‘good deflation’ as well as ‘good inflation’. Hence, to the extent the present drop in inflation in for example the US reflects a positive supply shock the Federal Reserve should not react to that by easing monetary policy. I have discussed that topic in among others this recent post. Another is that inflation targeting as it has been both most widely proposed and as it has always been adopted has been a “bygones are bygones” version, with no later compensation for past misses of the target. During the Great Recession, many central banks undershot their targets, even allowing deflation to occur. They never corrected their mistakes. Nominal GDP targeting in the form that Scott Sumner and others have advocated it requires the central bank to undo its past mistakes. Note here that Kurt comes out in favour of the Market Monetarist explanation of the Great Recession. It was the Federal Reserve and other central banks’ failure to keep NGDP ‘on track’ – and even their failure to just hit their inflation targets – that caused the crisis. That of course indirectly support for monetary easing to get the NGDP level back on track. I am sure that will enrage some Austrian School readers of freebanking.org in the same way as they recently got very upset by George Selgin apparent defense of quantitative easing in 2008/9. See for example Joe Salerno’s angry response to George Selgin here. See George’s reply to Joe (and Pete Boettke) here. I am, however, not at all surprised by Kurt’s views on this issues – I knew them already – but I am happy to once again be reminded that Free Banking thinkers like Kurt and George and Market Monetarists think very alike. In fact I personally have a hard time disagreeing with anything Kurt and George has to say about monetary theory. And I would also note that Kurt has been an advocate of the market based approach to monetary policy analysis advocated particularly by Manley Johnson and Bob Keleher in their book “Monetary Policy, A Market Price Approach”. The Johnson-Keleher view of markets and money of course comes very close to being Market Monetarism. For more on this topic see Kurt on Keleher here. With nominal GDP targeting it may well also happen that there will be flaws that only become apparent through experience. My reason for thinking that flaws are likely is that, like inflation targeting, nominal GDP targeting is an imposed monetary arrangement. It is not a fully competitive one that that people are at liberty to cease using at will, individually, the way they can cease buying Coca-Coca and start buying Pepsi or apple juice instead. Nominal GDP targeting when carried out by a central bank, which has monopoly powers, is a form of central economic planning subject to the same criticisms that apply to all forms of central planning. In particular, it does not allow for the occurrence of the type of discovery of knowledge that comes from being able to replace one arrangement with another through competition. I agree with Kurt here. Even if NGDP targeting is preferable to other “targets” central banks are still to a large extent very flared institutions. Therefore, it is in my opinion not enough just to advocate NGDP targeting – or even worse just advocating monetary easing in the present situation – we also need to fundamentally reform of monetary institutions. Finally, advocating NGDP targeting is not just a plain argument for more monetary easing – not even in the present situation. Hence, it is for example notable that the recent drop in inflation in for example the US to a very large extent seems to have been caused by a positive supply shock. This has caused some to call for the fed to step up monetary easing. However, to the extent that what we are seeing is a positive supply this of course is “good deflation”. So yes, there are numerous reasons to argue for a continued expansion of the US money base, but lower inflation is not necessarily such reason. I have been thinking about an issue that puzzles me – it is about inflation in an Austrian School style bust. Here is the story. If we think about a stylized Austrian school boom-bust then the story more or less is that easy money leads to an unsustainable boom that eventually – for some reason – will lead to a bust. What people often fail to realize is that the Austrian business cycle theory basically is a supply side story. Austrians will hate it, but you can tell much of the story within an AS/AD framework. The graph below is an illustration of this. What happens is that the central bank cuts interest rates below the Wicksellian natural interest rate. Investors are tricked into thinking that it is the natural interest rates that has fallen and as a result investments are increased. Austrians will of course object by saying “it is not a overinvestment theory, but a malinvestment theory”. Yes, that is right, but that is not relevant for the question I want to look at here. The boom happens not because of higher demand, but because of over (and mal) investment. 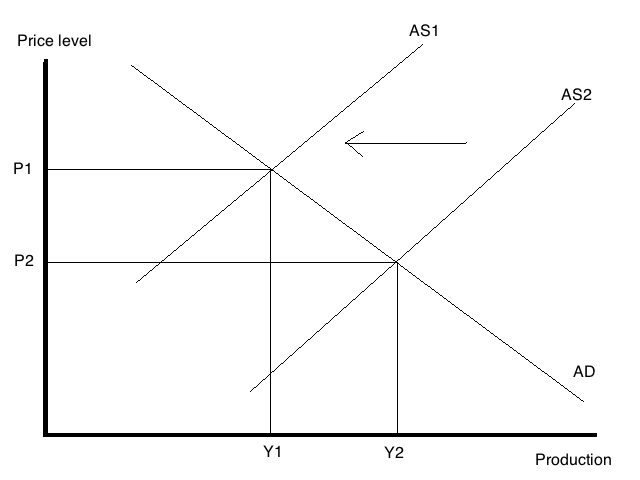 The production capacity of the economy is hence expanded – the AS curve shifts to the right during the Austrian boom and production increases from Y1 to Y2. We ignore the demand effects – so we keep the AD unchanged – as the Austrians really are not paying much attention to this part of the story anyway (and yes, I am aware the there is relative demand story – private consumption vs investments). Notice what happens with the price level initially. Prices drop from P1 to P2. Obviously that would not necessarily have to be the case if the AD curve also have shifted to the right as well (but that is not important for the story here). However, this pretty well illustrates the Austrian story that “headline” inflation will not necessarily increase during the boom. What happens – and we can obviously not realize that by just looking at AD and AS curves – is that we get what Austrians call relative inflation. Some prices rise, but the aggregate price level does not necessarily increase. So far so good. 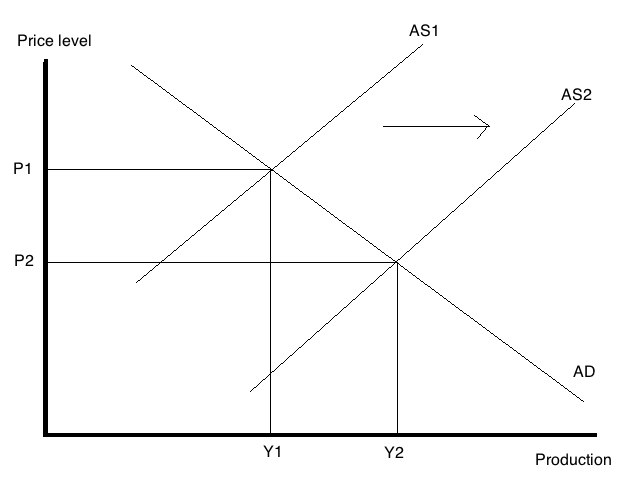 I know Austrian economists would say that I told the story in the “wrong way”, but I guess they will agree on the main points – Austrian Business Cycle Theory is mostly about the supply side of the economy and that the aggregate price level will not necessarily have to increase during the boom phase. At some point investors realise that they have made a mistake – the natural interest rate has not really dropped. Therefore, what they thought were good and profitable investments are not really that great. So as a result investors cut back investments – after the “bubble” have bursted a large part of the production capacity in the economy is worthless. This is a negative supply shock! The AS shift back leftwards. What is the result of this? Well, it is simple – the price level increases from P2 to P1. We get higher inflation. This might seem counterintuitive to most people – that the bust leads to higher rather lower inflation – but remember this is due fact that the Austrian boom-bust cycle primarily is a supply side story. And this brings me to what I really wanted to say. An increase inflation should be welcomed if it reflects a rational and undistorted reaction to investors realising that they have made a mistake. That is exactly what happens in an Austrian style bust. We might get relative deflation/disinflation, but the aggregate price level increases due to the negative supply shock. Therefore, when Austrians often argue that the bust should be allowed to play out without any interference from the government or the central bank then that logically mean that they should welcome an increase in inflation in the bust phase of the business cycle. That obvious is not that same saying that monetary policy should be eased in the bust phase, but inflation should nonetheless be allowed to increase as we get “benign” inflation. However, in my view that would mean that it would be wrong from an Austrian perspective for the central bank to tighten monetary policy in response to rise in (supply) inflation during the bust. Those Austrian economists who favour NGDP level targeting – like Anthony Evans and Steve Horwitz – would likely agree, but what about the “internet Austrian”? And what about Bob Murphy or Joe Salerno? Obviously the story I have told above is a caricature of the Austrian Business Cycle theory, but I think there is a relevant discussion here that need to be addressed. Is the aggregate price level likely to rise in the bust phase as natural consequence of market forces being allowed to run it cause? The reason that I think this debate is important is that some Austrians spend a lot of time arguing that the deflationary tendencies that we see for example in Europe at the moment are a natural and necessary bursting and deflating of a bubble. However, IF we indeed were in the bust phase of a Austrian style business cycle then we would not be seeing deflationary tendencies. We would in fact be seeing the opposite – we would see HIGHER inflation, but at the same time relative deflation. Obviously this is not what we are seeing in the US and Europe today – inflation in both the US and the euro zone is well-below what it was during the “boom years”. That mean that we are not in the bust phase of an Austrian style boom-bust. There might very well have been a boom-bust initially (I believe that was the case in some European countries for example), but we have long ago moved to another phase – and that is what Hayek termed secondary deflation – a downturn in the economy caused by an monetary contraction. PS Take a look at what happened in the US in 2007-8. Overall inflation did in fact increase as the economy was slowing, while we at the same time had relative deflation in the form of falling property prices. However, starting in the Autumn of 2008 we clearly saw across the board deflationary tendencies – here it is pretty clear that we entered a secondary deflationary phase caused by a monetary contraction. This is consistent with an Austrian interpretation of the Great Recession, but it is not a story I have heard many (any??) Austrians tell. And of course it is not necessarily the story I would tell – even though I think there is a lot of truth in it. PPS The graphs above could indicate that both production and prices shifts back to the initial starting point during the bust. That obviously would not have to be the case as I here have ignored the shift in the AD curve and as any Austrian would note the AS/AD framework is not telling us anything about relative prices.